Green infrastructure has been widely discussed as a solution for taking pressure off of outdated stormwater systems. Through natural technologies like green roofs, rain gardens, bioswales and green road medians, green infrastructure can absorb and filter excess water at the source, in effect, decentralizing stormwater management. 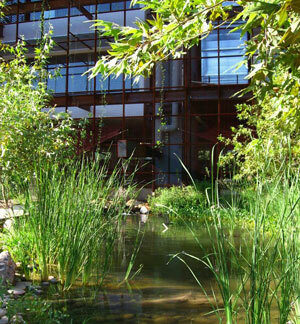 Green infrastructure can also reduce the costs of water treatment because these natural systems reduce water flow, remove toxins, and recharge groundwater supplies. At an ASLA-organized advocacy event, Becky Hammer, a lawyer with the water team of the Natural Resources Defense Council (NRDC), outlined a recent legislative proposal gaining support on Capitol Hill, “The Green Infrastructure for Water Act,” which would help take green infrastructure methods from theory to practice. As Hammer explained, “at the Washington, D.C. headquarters of the E.P.A., they like green infrastructure in theory.” However, in reality, there are a range of obstacles preventing expanded use of these technologies. Representative Donna Edwards (D-MD) is the lead sponsor of the green infrastructure legislation, which would ramp up the use of green roofs, rain gardens, and “constructed restorations of green spaces” for stormwater management through $350 million in annual funding. The proposal would expand the use of green infrastructure to clean water. Hammer said “these systems not only take stress off old infrastructure systems (many of which are combined sewer / water systems) but also save money and create jobs.” Additionally, all those working green infrastructural spaces have potential dual uses — some can also function as parks (see earlier post) or green spaces that reduce the urban heat island effect. The idea is to both integrate green infrastructure into communities and make these systems more visible so people understand the natural processes. Centers of Excellence: $25 million would go to 3-5 centers dedicated to green infrastructure research. The centers would be housed at universities across the country. “Right now, there are great pilot projects, but no centralized knowledge base so many designers have to recreate the wheel when doing green infrastructure projects,” Hammer argued. E.P.A. grants: Some $300 million in grants would be awarded by the E.P.A. to state or local governments or local water authorities to design or implement green infrastructure projects. Designing projects could include the creation of portfolio standards. The legislation would target low-income or disadvantaged communities as well as those with combined sewer / water treatment infrastructure. The idea is that green infrastructure would not only reduce the cost of stormwater management, but also create amenities for underserved communities. New E.P.A. Office of Green Infrastructure: A new office of green infrastructure would be created and staffed under the E.P.A.’s Water office. “Right now, the E.P.A. has one person full-time dedicated to green infrastructure. She’s great, but we need more people.” The new E.P.A. office would receive $25 million in funding. Lack of centralized information on green infrastructure and stormwater managment best practices. In selling the economic benefits, Hammer said green infrastructure should be viewed as an infrastructure investment. “These approaches mean lower stormwater feed-in levels and reduced amounts of water going into water treatment facilities. Also, green infrastructure projects designed as appealing green spaces lift neighboring property values and can lead to energy savings.” What many don’t realize is that those massive water treatment facilities use tons of energy. To learn more, check out green infrastructure resources, including research studies, projects, and government reports. I am excited about the potential green spaces if this bill is approved! there are already so many good ideas, the big limitation is our conservative and timid approach with respect to influencing policy and devising useful new business models. This conversation helps- thank you for bringing it up and providing some good links!